The Birth of a Nation takes an often depicted topic and gives it a slightly different slant than we are used to seeing. Slavery in this country has been the fodder of major motion pictures since the epic drama Roots aired on television in the 1970's. The injustice befallen on African Americans has fascinated and horrified us and has been depicted in graphic detail on occasion. While the stories have been told time and time again, it seems we can't seem to get our fill of the tales of rapes, beatings, and murders of innocent lives. A new movie, out now on Blu-ray, DVD, and Digital HD gives a slightly different slant on the topic but is no less powerful a message than its predecessors. The Birth of a Nation is a historical account of a terrible time in American History – man's inhumanity towards man – both whites and blacks. The whites, as masters, treated blacks as less than human and more like property they owned and the blacks, as slaves, sought retribution for their brutal treatment by killing their "Masters". It is the story of Nat Turner (Nate Parker; Non-Stop), a literate slave and preacher who lead a suicidal uprising. It should be noted that much of the story in this case could be fiction because little is really known about Nat Turner and his followers, except that which has been written by white historians. As a young child, Nat is taken under the wing of the prejudiced but pious Elizabeth Turner (Penelope Ann Miller; The Artist), the wife of the plantation owner who owns Nat and his family. Recognizing intelligence in Nat, she encourages him to learn to read the scriptures. As Nat grows up on the Plantation, he becomes the preacher of the slaves living there. However, when the Plantation is turned over to Sam Turner (Armie Hammer; The Man from U.N.C.L.E.) and it falls on hard times, Sam offers Nat as a preacher for hire to other slave owners, giving him unprecedented access to other slaves, which helps him to formulate a rebellion. This movie was seven years in the making and cost around ten million dollars. Obviously, this was a labor of love for Parker who not only starred in the film but co-wrote and directed it as well. He gave a passionate performance as a Virginia-born slave and preacher who inspired other slaves to follow him, ultimately to their deaths. His directorial debut is heartfelt and sincere and one can tell he gave everything he had to the project. Unfortunately, not everything was incredible and there were moments when Parker's performance could have been stronger. Also, other characters were not always clearly defined and little attention was paid to Aja Naomi King's (How To Get Away With Murder) character development. As Cherry, I felt there was so much more to be told about her but it may have been left on the cutting room floor. Hammer was good enough but I wonder if Sam would have been more engaging to watch had he been portrayed by someone else. 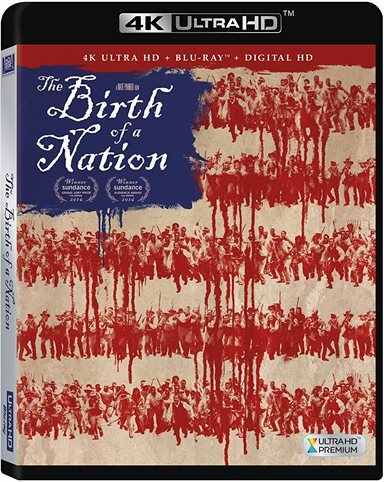 The 4k Blu-ray boasts an excellent (if not gory at times) visual of the horrors of slaves and war. The 2160p High Definition video and DTS-HD Mater 5.1 audio are both sharp and clear with vibrant hues and a lossless soundtrack. The mix leaves a little to be desired, though, as I had to adjust the volume several times to hear the dialogue. Audio Commentary: A somewhat tedious narration by writer/producer/director/star Nate Parker as he gives a play-by-play as to every thought and idea he had for his vision. Rise Up: The Legacy of Nat Turner (47:13): For those that like the occasional documentary, this feature looks at the places in Virginia where the story took place. Hosted by actor Roger Guenveur Smith, it presents interviews with historians and professors who offer their insight. The Birth of a Nation: The Making of a Movement (41:46): A behind the scenes look at the four-year process of writing, producing and filming the movie. #AmeriCAN (18:33): A short film by Parker exploring rash behavior and the aftermath of one's actions. Free God (6:28): Another short film, written, and directed by Dwight Wilson JJ. Celebration of Independent Voices (4:38): A brief intro taped at the films' Sundance screening. The movie won the AudienceAward and the Grand Jury Prize at the acclaimed film Festival. Shooting Script: A neat but superfluous feature where the screenplay can be viewed manually. The Birth of a Nation takes an often depicted topic and gives it a slightly different slant than we are used to seeing and while Parker's version is intriguing to a certain extent, it didn't offer quite enough to keep me enthralled throughout. I walked away feeling as if there were segments that were incomplete and that Parker was sometimes overindulgent of his "baby". However, it is still a strong film that deserves viewing. Download Birth of a Natiaon from the iTunes Store in Digial HD. For more information about Birth of a Natiaon visit the FlickDirect Movie Database.